The reason we’ve entitled this guide ‘How to choose a marketing agency’ and not ‘Do you need a marketing agency’, is because if you’re a business that’s serious about getting great results, growing your business, building your brand and attracting and retaining pro table customers, then actually, you need a agency to help you. Of course, we would say that, wouldn’t we? But actually just finding any old agency isn’t good enough. You need to find one that will match your business needs and help you deliver the results you’re looking for. And there are a lot of agencies out there! 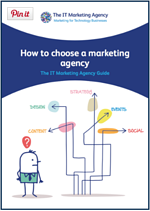 So this little guide is to help you identify the type of agency you need, so that you don’t have to kiss quite so many frogs in the process!